We are Car‑Wal Garage Doors, a garage door business since 1973. Our promise is quality work that exceeds your expectations every time you need us. Call us at 905-304-9700 for all your garage door needs today. If your garage door isn’t working properly, call Car‑Wal Garage Doors at 905-304-9700 for emergency service that you can always count on. You can also complete our online service form for garage door repair in the Mississauga area, including Hamilton, Kitchener, Waterloo, Guelph, Oakville, Simcoe, Port Colborne, Brantford, St. Catharine’s, Grimsby, Beamsville, Binbrook and surrounding areas. Mississauga is one of the biggest city in Ontario and Canada's sixth‑most populous municipality. You can see it by its different house styles through its neighbourhoods. We have garage doors that coordinate perfectly with every architectural style, including traditional, carriage, and contemporary. You can see the hundreds of style options we have available in our online image gallery. We specialize in garage door installation, service and maintenance at Car‑Wal Garage Doors. We are always stocked with decorative accents that add charm to your home and replacement parts for repairs. Need a replacement panel? Broken springs? Is your garage door opener not working? 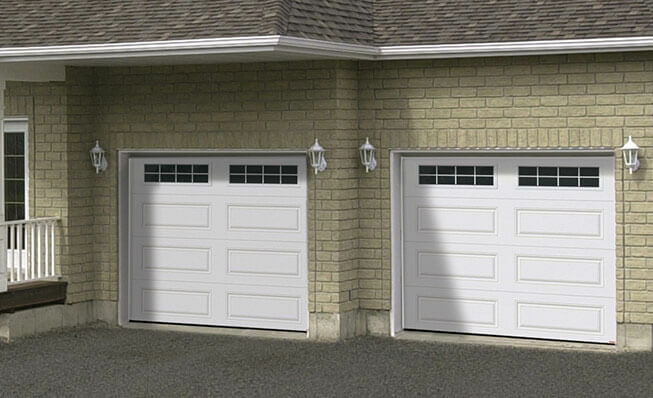 We service all garage doors in Mississauga. Here at Car‑Wal Garage Doors, we recommend LiftMaster products for the best performance in a garage door system. Whether you need a reliable garage door opener for your home, or for an industrial or commercial garage, we offer reliable accessories. Contact us today to get a free quote. We recommend insulated GARAGA garage doors for the ultimate in energy savings. Keeping your home comfortable year‑round is tricky with Mississauga’s cold winters, rainy springs, and hot and humid summers. The Standard+ door and the GARAGA Cambridge door models both provide R‑16 thermal resistance for high energy efficiency. Take a look at our Design Centre to see how it will look on your home.